This vegetable Pad Thai is not as sweet or high in fat as restaurant versions, and is made vegetarian by using only fresh veggies and tofu, and replacing the typical fish sauce with hoisin sauce. For a gluten-free version, simply omit the hoisin sauce and for a vegan version, omit the egg. 1. Soak the rice noodles in warm water for 30 minutes. 2. Whisk the lime juice, hoisin, sugar, ginger, garlic and chili paste together and set aside. Before you begin cooking, have the other ingredients prepared and on hand. 3. Heat a large wok or skillet on high heat and add the oil. Add the egg and stir immediately, cooking for a minute until firm. Add the mushrooms, snap peas and peppers and toss for a minute. Pull the soaked noodles from the water and add to the pan, along with the green onions, bean sprouts and tofu, stirring for 30 seconds. Add the lime juice mixture and toss well to coat and warm through. 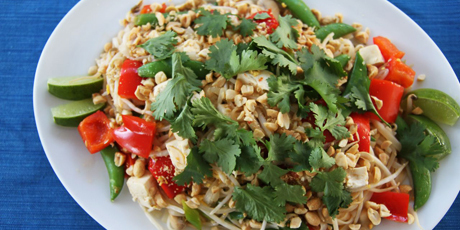 Place the pad Thai on a platter and top with the chopped peanuts, coriander and basil. Serve immediately.